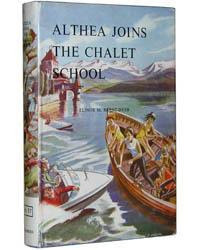 Bookride: Althea Joins the Chalet School. Elinor Brent Dyer, 1969. Althea Joins the Chalet School. Elinor Brent Dyer, 1969. Elinor Brent Dyer. ALTHEA JOINS THE CHALET SCHOOL. Chambers, London, 1969. EBD's Chalet School novels have a very large world wide following with collectors willing to pay high 3 figure sums for difficult o/p titles. They are beautifully written multi layered stories with much period detail and a Swiss setting. There are conferences, quizzes, newsletters and websites. Elinor Brent Dyer wrote 101 girls' stories many with school settings. A holiday spent in the Austrian Tyrol at Pertisau-am-Achensee gave her the inspiration for the first location in the Chalet School series. Her teaching career spanned 36 years with her final post as Headmistress of a school in Hereford. She also wrote plays and numerous unpublished poems and was a keen musician. Her market has been a little dented by reprints and even this book is about to be reprinted by 'Girls Gone By' at £11. The story of Althea Glenyon a new girl who is involved in a midnight caper where a burglar is unmasked and inspires jealousy through her close friendship with some plucky girl. Exciting adventures afloat and ashore break into school routine, involving Althea in some embarrassing situations. At the end of her first term, however, Althea has proved herself and looks like settling in to become a real Chaletian. Odd stuff for 1969 with Manson on the prowl, Woodstock, Vietnam and the first flight of Monty Python. VALUE? Hardbacks in jacket £100+ for nice copies. Jonkers of Henley ask £220 for a faultless copy. If God collected EBD (and he/she probably does) this would be the copy he would choose. Dyer titles esp from the 1920s and early 1930s in bright jackets can get over £500. Signed copies are almost unheard of. This title, although comparatively modest in value is much wanted. Also much desired is The Chalet Girl's Cook Book from 1953 worth about the same as this book in nice jacket. It can make about a £100 without it - higher than this novel sans jacket. I love the Chalet School - used to collect them in Paperbacks during the 1980s. Managed to get most of the series, but there were always a few hard to find volumes. I sold my collection when I moved overseas.